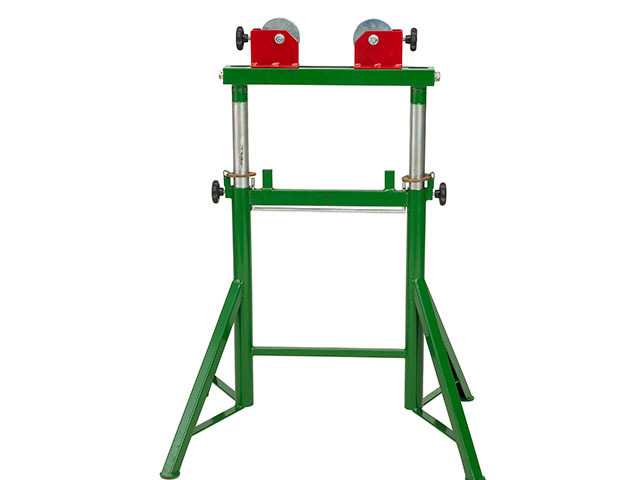 The Rollapipe Pipe Stand is a complete solution for pipe rotation within the workshop. Pipes up to 48″ and 900 kg can be rotated quickly, accurately, and safely. Rollapipe stands are fitted with dual safety locking rings, which create a safety zone around the adjustment area to minimize risk of pinch injuries. The rings also prevent the stands from slipping, even when under maximum load. The Rollapipe Pipe Stand is one of the safest stands on the market. Stands are fitted with a quick release handle, which makes adjusting the height of the stands easier than ever. The Rollapipe Pipe Stand is available as a 24″ Fixed Stand, a 31″ Fixed Stand, a 29″-42″ Adjustable Stand, and a Bench Roller. All options are rated to 900 kg, but the SWL of the modular heads vary, contact us for details if required. The steel wheel heads and rubber wheel heads have bronze bearings to eliminate arcing and the wheels are trued for accurate pipe rotation. Every stand is supplied with an attached spirit level, to ensure the unit is in the optimum position for operation. Our range of interchangeable modular heads means one stand can support a wide range of carbon steel and stainless steel pipes without contamination. Ball transfer heads, steel wheel heads, rubber wheel heads, and a range of stainless steel head options are available.